Glorious Christmas panorama with atmospheric background lighting. 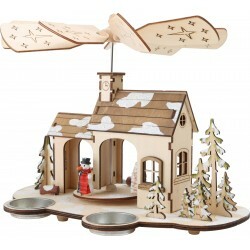 A winter wonderland for the Christ..
Musical Box and Lamp "Wooden House"
This beautiful wooden house is wonderfully carved. The Christmas house is designed for all kinds of .. This super lamp features a winter landscape on different levels. The lamps and houses are fitted wit.. These individual hanging decorations are very popular and are real eye-catchers for the Christmas se..